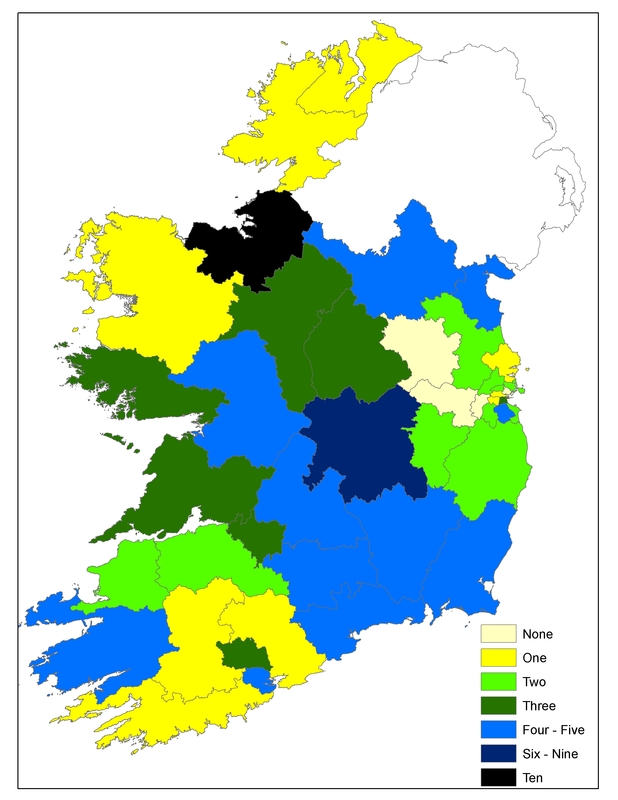 The last post showed that certain parts of the states and certain constituencies – mainly two-county constituencies located in mainly rural areas such as the Midlands and parts of the North-West and South-East regions – tend to be over-represented at the expense of other areas when it comes to studying the geographical composition of the Seanad (vocational panels) electorate. As the map above shows (detailing number of Seanad vocational panels candidates per general election constituency) the geography of candidates largely mirrors that of the Seanad voters geography, with a tendency for the regions with the highest number of Seanad electors to also be the regions with the highest numbers of competing Seanad candidates, although certain constituencies are better represented here than their levels of Seanad voters would have suggested (e.g. Kerry South, Cork South Central, Dun Laoghaire, Limerick). Thus, it could be suggested that parties are purposely nominating candidates hailing from those parts of the state where they stand a good chance of amassing significant numbers of local votes, or else candidates from these areas are pushing forward for nomination based on a similar logic. 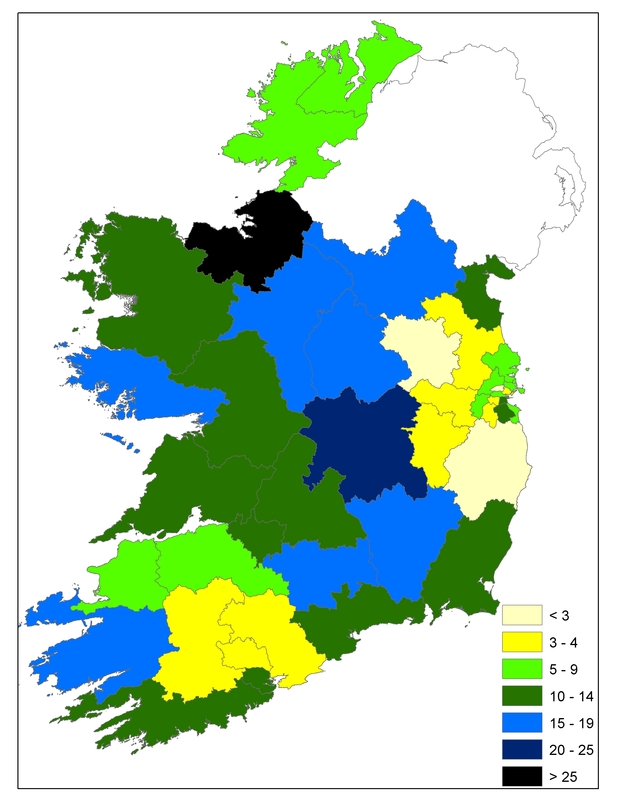 To show that this is not just a one off phenomenon, a study of candidate nomination patterns taking in the three previous Seanad elections, as well as the current contest, shows a largely similiar geographical pattern. In this map the mainly rural and often two-county constituencies, associated with the highest number of Seanad electors and covering an area strethching south-eastwards from Sligo down through the Midlands towards the South-East region, again tend to be over-represented. Again, some constituencies such as Kerry South and Cork South West fare much better than the available number of Seanad electors within these constituencies would suggest. Within Dublin, the constituencies of Dublin South and Dun Laoghaire, while associated with average levels of Seanad candidates relative to the rest of the state, rank significantly stronger than the other Dublin constituencies. As Table 1 above shows, there tends to be a stronger concentration of 2011 Seanad candidates within certain regions for some of the vocational panel contests. There is, for instance, an especially strong concentration of Munster-based candidates in the Agricultural, Administative and Cultural and Educational panel contests, with Leinster accounting for an especially high proportion of Labour panel candidates and Connachtt-Ulster accounting for an especially high proportion of Agricultural panel candidates. Dublin accounts, perhaps not surprisingly, for an exceptionally low proportion of the Agricultural panel candidates, but fares much better in terms of its proportion of Adminstrative, Cultural and Educational and Industrial and Commercial candidates. This entry was posted in Candidates, Election data, Electoral Geography (voting maps), Seanad election, Uncategorized and tagged maps, Seanad. Bookmark the permalink.